COA1 Sunday Report – Extreme Wet Can’t Stop These Racers – CKN | CanadianKartingNews.com | Because Karting is a way of Life! 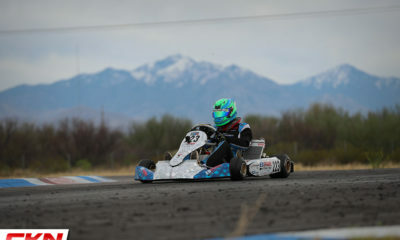 At one point on Sunday at CalSpeed Karting in Fontana, California, the Challenge of the Americas race officials considered stopping the on-track activity. The rain was pouring down quite hard and in some sections of the circuit, located in the parking lot adjacent to the Autoclub Speedway, it looked more like a speed boat race than a kart race. 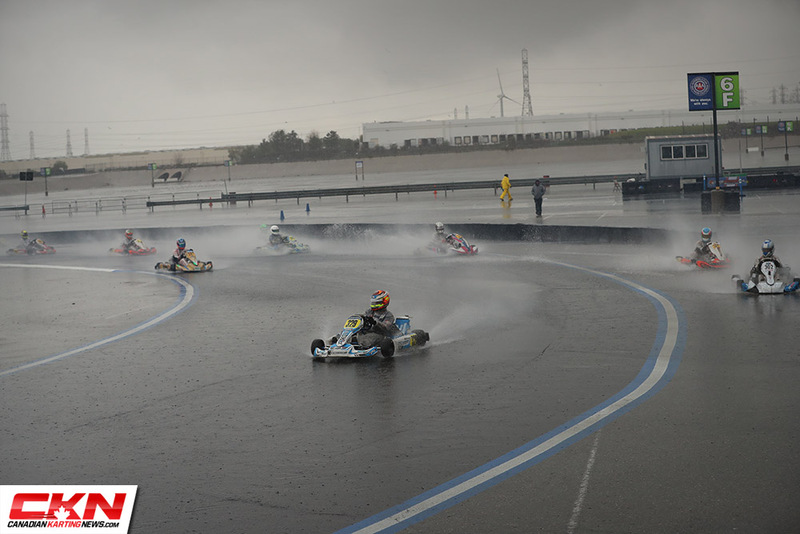 Waves of water were really challenging the drivers, but, while it was challenging, the majority of those on the track were handing the conditions like the professionals they are, so the competition continued. And, just like the that, the first round of the Challenge of the Americas is in the books. Not quite the weather or temperatures anyone was expecting in southern California, but it is winter after all. Here’s a recap of the Sunday Finals. 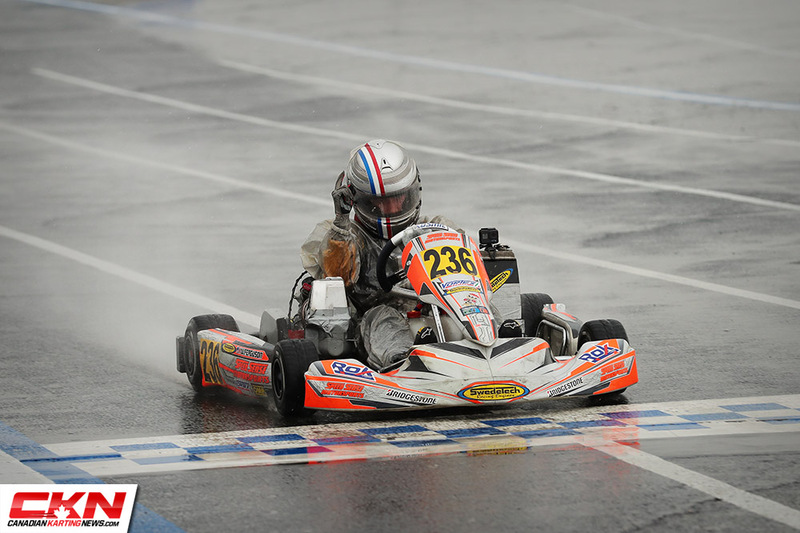 Filippo Sala doubled up on first place trophies in Micro Rok. He built up a big lead but slowed up in the final laps, allowing Zachary Walrod to close in. The traded the lead on the white flag lap but Sala regained in the right spot and crossed the finish line by 0.095 seconds to score the win. Gage Jarvis finished third. 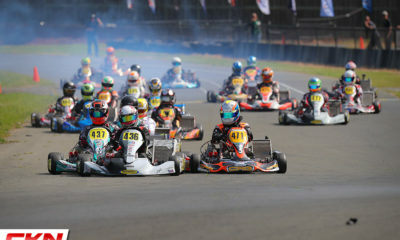 After letting Saturday’s race winner get away, Enzo Deligny made sure he made no mistakes on Sunday in Mini Rok. 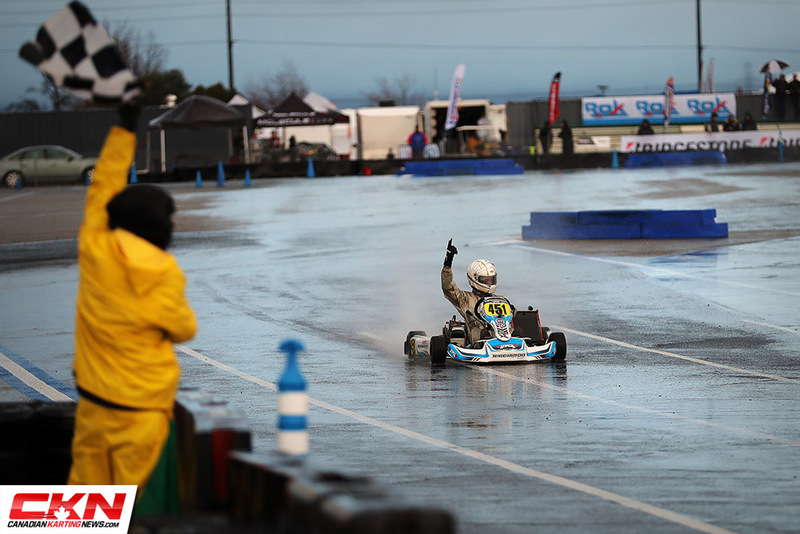 The young driver conquered the conditions and drove home the race win by 11 seconds over Logan Toke. Ethan Thorne completed the podium. 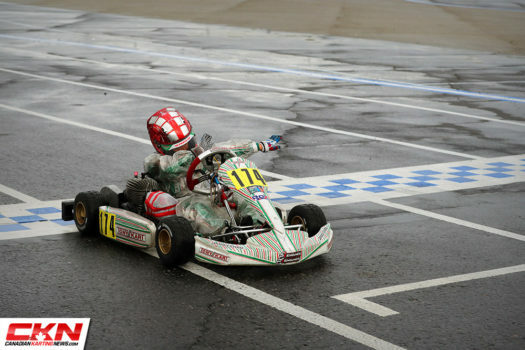 Lap traffic became an issue in the Junior Rok Final and it, unfortunately, had an effect on the great race for the lead. Ethan Ho led the majority of the race, but William Ferguson closed in on the leader in the second half. As the two began to navigate the lap traffic, they also traded the lead. With Ho in the lead and only two laps left, he made a move to the inside of a lapped kart who was recovering from running wide in the previous corner and the two made contact, sending Ho into a spin. Ferguson narrowly avoided and gain the lead and from there held on for the win. Ho returned to the track but Cole Morgan slipped by for second and he had to settle for third at the finish. 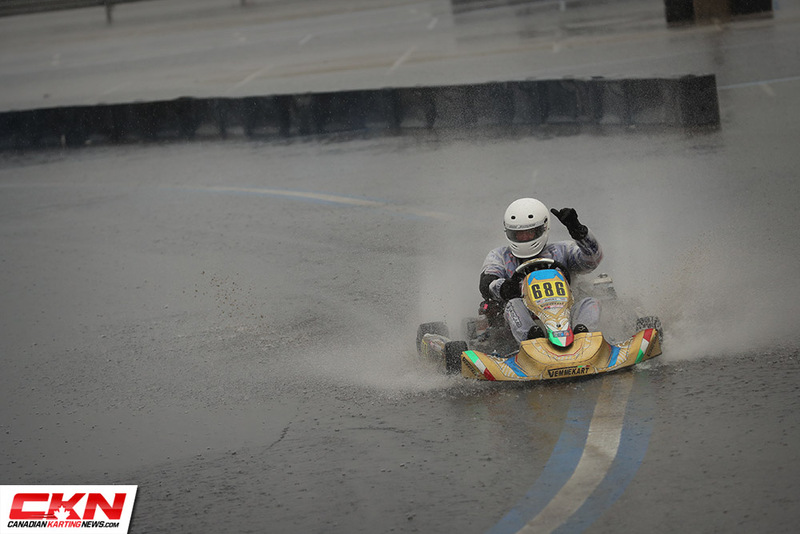 The heaviest the rain fell on Sunday was during the Senior Rok final. The start looked more like a water cannon when the field rushed into turn one, but they all made it through. The lead changed hands a number of times as the drivers searched for the best lines around the circuit. Jake Drew was the first to lead until he spun on the main straight. Then it was Jordan Redlin’s turn at the front. But he found some deep water in the exit of the hairpin. Even Barrett led the middle stages of the race before defending champion Jim McKinney took over. Finally, with two laps left, Drew recovered from his spin, falling only as low as fifth, to overtake McKinney for the lead and score the race win. McKinney held on for second with Colby Dubato on the podium for the second straight day in third. Callum Smith looked like he had the Shifter Rok Final in the bag, that is until he pushed a little too hard into turn one, spun and found the barrier. That ended his race and offered the lead up to Nicky Hays, with Kol Bailey closing in. Bailey posted his fastest lap of the race on lap ten, only to retire three corners later, surrendering the runner-up position. Hays held on in the crazy conditions to secure the victory. 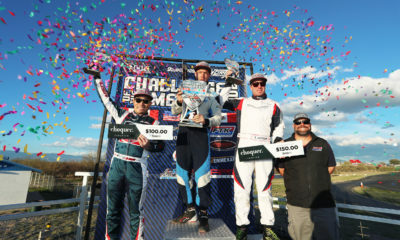 Ron White was a distant second, even after a time penalty, while PreFinal winner Prescott Campell recovered for an unlucky first lap to grab the final step of the podium. 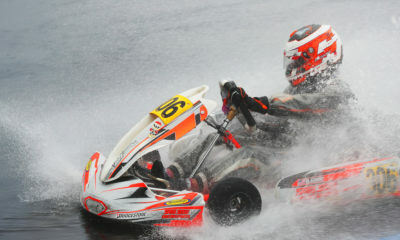 In similar conditions to the Senior Rok Final, the Masters Rok drivers were really challenged when the skies really opened up. For them, the track worsened every lap as their race continued on, but that didn’t stop Erik Jackson and Derek Wang from going toe-to-toe. Lap after lap, the two were bumper to bumper, navigating the puddles and remained close. Jackson led nearly the entire race and managed to keep Wang behind on the final lap to score the race win. A very distant third was Nick De Graaf, who crossed the finish line fifteen seconds adrift. Other race winners on Sunday were Neil Joseph in Rok Shifter Masters, Jackson Dunn in 100cc Senior and Jimmy Gregory in 100cc Masters. Round two of the Challenge of the Americas hits the track in a months time in Tucson, Arizona.